Many a time we come across a scenario where we need to execute some code based on whether a Trigger exists or not. This article explains how we can check the existence of Trigger with extensive list of examples. We can use the sys.triggers catalog view to check the existence of a Database scoped triggers. DML triggers are Database scoped triggers, where as DDL triggers can be DATABASE scoped or SERVER scoped. The DDL triggers with Server level scope gets fired in response to a DDL statement with server scope like CREATE DATABASE, CREATE LOGIN, GRANT_SERVER, ALTER DATABASE, ALTER LOGIN etc. Where as DATABASE scoped DDL triggers fire in response to DDL statement with database scope like CREATE TABLE, CREATE PROCEDURE, CREATE FUNCTION, ALTER TABLE, ALTER PROCEDURE, ALTER FUNCTION etc. We can write a query like below to check if the DML trigger AfterTriggerExample exists in the current database. From the above results we an see that even though the current database is MASTER database, we can check the existence of a Trigger in another database by using three part naming convention for the sys.triggers catalog view. From the result it is clear that sys.triggers catalog view can’t find a server scoped DDL trigger even though it is present. To find server scoped DDL triggers or LOGON Triggers we can use the sys.server_triggers catalog view. 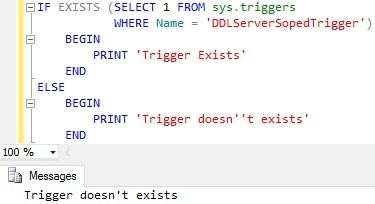 We can write a query like below to check the existence of a Server scoped DDL trigger DDLServerSopedTrigger using the sys.server_triggers catalog view. From the above examples it is clear that we can use the sys.triggers catalog view to check the existence of the Database scoped triggers (i.e. DML Triggers and Database scoped DDL Triggers). 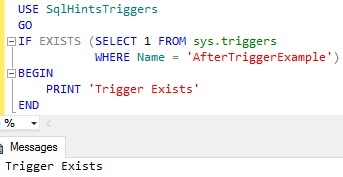 Where as we need to use the sys.server_triggers catalog view to check the existene of the Server scoped triggers like Server Scoped DDL Triggers and LOGON triggers.